In simple terms, sports therapy and rehabilitation aim to improve joint and muscle function. It can help relieve pain and improve movement and restore function and fitness. This includes flexibility, strength, and coordination training. 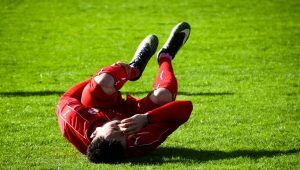 If you’re fed up with an injury stopping you from training, we have the expertise and can help get you back on track. We work with professional, amateur and recreational athletes, across a variety of sports. We treat the members of several local sports teams, including providing therapy and matchday services for Clwb Rygbi Dinbych. We have worked with track and field athletes, swimmers and cyclists. Our main objective is to get you back on your feet and back to running. Once we have got to the root cause, treatment usually starts with symptom management, including taping, and hands-on therapy. We then progress to correcting poor movement habits that may have developed as you have continued to run while injured. We train you in stretching and strengthening to return you to running while reducing the risks of further injury.